Please recall Barack Hussein Obama, Junior's half-brother, George Obama, who lives in a shack in Kenya and who lives on $1.00 a month. Zeituni Onyango, no financial help from her nephew Barry. She is a frail woman who walks with the aid of a metal stick. 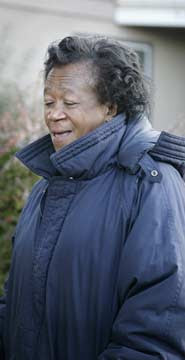 Neighbours said that she lived alone in a ground-floor flat normally set aside for people facing physical hardship. The Obama campaign was repeatedly approached for comment yesterday (regarding his destitute aunt) but had not responded at the time of going to press. Boy oh boy, if John McCain or Sarah Palin had blood relatives living in poverty or squalor, the MSM would be portraying them as insensitive, cheap, mean louts who don't care about anyone. But because it's Obama - you guessed it again - he gets a Free Pass. I don't know about you, but I can't wait for Barry to take care of all of us in the same manner and way that he takes care of his half-brother and his aunt.